Bernie Moreno, left, sold some of his Ohio dealerships to Terry Rafih of Windsor, Ont., saying: "For me, the car business was less fun than it was when I started in it 20 years ago." 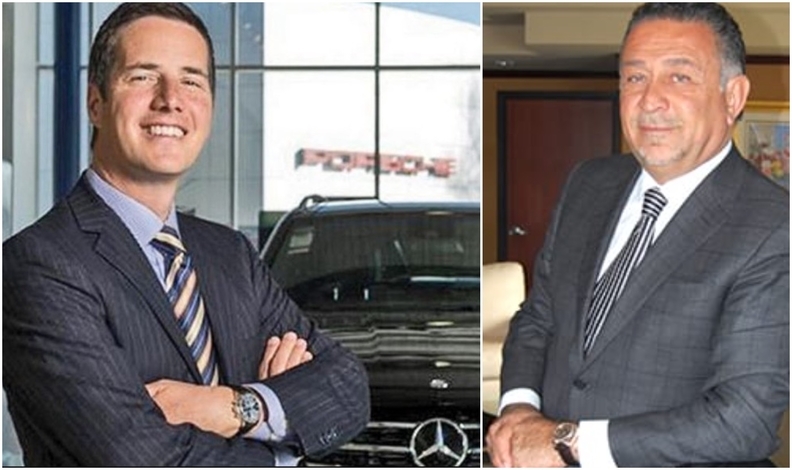 Longtime Ohio dealer Bernie Moreno, who two years ago had 10 stores and planned to focus on luxury makes, now will keep just two dealerships after selling his Mercedes-Benz, Porsche and Cleveland Motorsports businesses to a Canadian dealership group. Moreno, president of Bernie Moreno Cos., sold his first store, Mercedes-Benz of North Olmsted, which he bought in 2005, plus Porsche of North Olmsted and Cleveland Motorsports -- which sells Rolls-Royce, Bentley, Maserati, Aston Martin and Lotus vehicles -- to Rafih Auto Group in Windsor, Ont. The deal closed late last month and Bel Air Partners in Hopewell, N.J., handled the sale for Moreno. Terms were undisclosed. Moreno, 52, said he will keep Buick-GMC of Beachwood in suburban Cleveland and Infiniti of Coral Gables in Florida. Moreno told Automotive News on Wednesday that he sold most of his dealerships over the past few years because he wants to focus more on his technology-related companies. "For me, the car business was less fun than it was when I started in it 20 years ago," he said. Moreno said the factory-dealer relationship has changed for the worse over the years. He also is frustrated by what he called expensive dealership improvement mandates vs. the need for automakers to invest more in online technology to aid the customer experience. Three years ago, Moreno had 15 rooftops, 1,000 employees and US$1 billion in annual sales. He said he had to make a choice. "Do I keep going forward and build an even bigger enterprise, or where is this thing going in the next 10 or 15 years?" he recalled. By keeping two stores instead of adding dealerships, there's a "lot less risk on the table." Moreno said he hopes to use some of his proceeds from dealership sales to help grow technology-related endeavors, many focused in the auto industry. One is a company called CHAMPtitles, which digitizes paper titles and enables states to issue them at less cost than today, Moreno said. States could process vehicle title transactions electronically powered by blockchain technology, according to CHAMPtitles' website. Moreno also has an investment in Dryver, a company that provides chauffeurs to drive people in their own cars. Moreno has other projects in the works. Terry Rafih, CEO of Rafih Auto Group, could not immediately be reached for comment. The dealership group has franchises including Sprinter, Mazda, Mercedes-Benz, Land Rover, Lincoln, Jaguar, Toyota, Lexus, Smart, Ford, Mini and BMW in Windsor; Ford in London, Ontario; a Honda store in Toronto; a Chevrolet-Buick-GMC store in Leamington, Ontario; a Chrysler-Dodge store in North Essex, Ontario; and a Chrysler-Dodge-Jeep-Ram dealership in Brampton, Ontario, according to the auto group's website.